woman ahead of her time and writer of the Canadian classic The Curve of Time. This account of a young widow and her children who cruised the beautiful islands and inlets of the West Coast in a small boat during the 1920s-30s has been a bestseller since it was first told. But little is known about what inspired Capi's spirit and resilience. What tied Capi to the West Coast, despite her upbringing and family ties in Eastern Canada? What made her see possibility in travelling the course by boat? 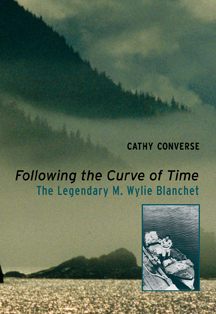 In Following the Curve of Time, Cathy Converse retraces Capi's travels to remote anchorages, and First Nations villages and along the unique BC coastline to learn more about the life of this very private woman who has kept readers and boaters captivated for decades. Cathy Converse is the author of MainStays: Women Who Shaped BC and, with Beth Hill, The Remarkable World of Frances Barkley. She has taught sociology and criminology at Camosun College and served as chairperson of the Social Sciences Department. Her passion is to tell the stories of women who have always been at the forefront of making history and involved in the shaping of their communities. She and her husband have cruised the west coast for 20 summers, always with a copy of The Curve of Time aboard. Cathy lives in Victoria, BC. There is another very interesting report about Cathy Converse and the book "Following the Curve of time". the Curve of Time by Cathy Converse.